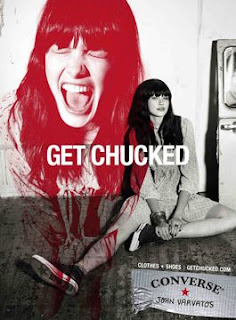 While browsing Vogue I came across this ad for Converse Chuck Taylors. According to The One Hundred by Nina Garcia, "This is the shoe that the models are always wearing when walk out of shoots and that every downtown girl wears in her down time." She also states that today, Converse are found next to Louboutins and Manolos in women's closets. Since I started reading this book, I found that I dont completely agree with everything Nina suggests a woman should own. 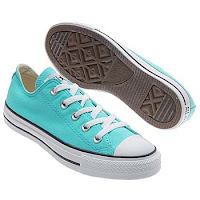 But, this is one thing that I am on the fence about and I just might grab a pair in turquoise or purple, Chic!